Just How Many Cigarettes Did Matthew McConaughey Smoke in True Detective? This is totally silly because it was two years ago but anyone who saw True Detective season one knew a few things to be true. 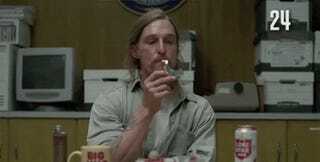 That Matthew McConaughey was going to win an Oscar for Dallas Buyers Club because of his performance as Rust Cohle in True Detective and that as foul as cigarettes are, you wish you could enjoy them like he did on screen. How many times did he get to make you jealous? A clean 40. Two packs of on screen inhaling joy. Watch the video below by EchoEdits7 showing Rust Cohle doing his smoking thing.